Shortly after finishing dinner, Lauren started complaining of severe pain in her stomach. The following morning at breakfast, she immediately cried out in pain as soon as she took a bite. Her parents, Beth and Don, knew this cry wasn't normal, and immediately took her to the emergency room for what they thought was an appendicitis. Upon arrival, Lauren was given a CT scan that showed a tumor sitting just behind her stomach, against her spine. After confirming it was cancerous, the family was rushed to the local children's hospital to start chemotherapy and radiation, in hopes of shrinking the tumor before the necessary surgery. A social worker from the hospital gave Lauren's parents information about The National Children's Cancer Society, and the family submitted an application. An NCCS caseworker contacted them within a week. "I remember thinking how compassionate and understanding they were when I spoke to the woman on the phone. She asked a few brief questions so that she could get an understanding of what we would need," recalls Don. Over the past year, the NCCS has been helping Lauren's family with travel expenses as they drive back and forth from their home to the hospital, which is about an hour commute. Beth and Don also frequently visit the NCCS website and read the survivor stories to get additional information (and hope) from other survivors' stories. 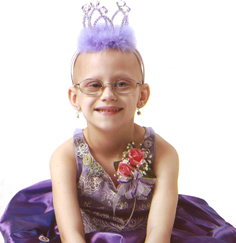 In late summer 2012, Lauren and her family were blessed with great news: Lauren's cancer had gone into remission. They still travel to the hospital for regular check-ups and for Lauren to undergo physical therapy. Her treatment had weakened her leg muscles, so Lauren has to learn to walk again. Thankfully, Lauren is an active five-year-old who continues to be an inspiration to her family and friends. She enjoys dancing, playing with her older brothers, and watching Michael Jackson videos, and starts kindergarten in the fall!